Amish Barn, Lancaster County, PA. Terrific drawing Bob. It's so picturesque around those parts. We used to go over that way whenever we could. Beautiful work, the scalloped edge, the windo and that weather vane. Pretty. very nice Joe! 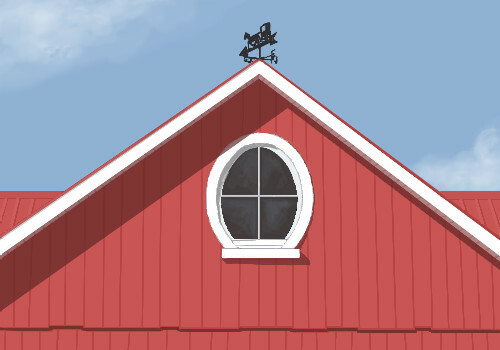 It feels like it's a mild, low 70's kinda day and a light breeze movin that horse/buggy vane around. real nice feel to this. Pan lower so we can see Grant Woods Farmer and Wife! I know, it's different, but mademe think of that. lovely crisp draw. I can feel the sun in this, it's full of warmth. Pretty loft window...I love barns.